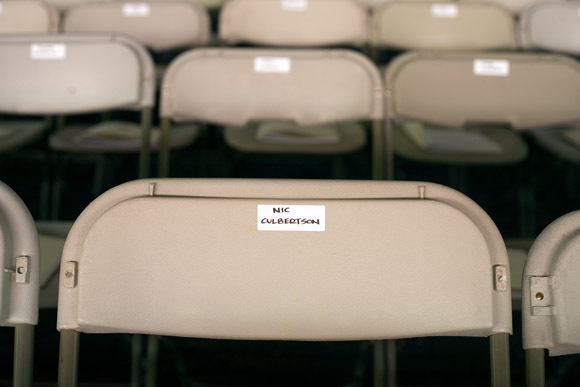 A sticker reading "Nic Culbertson" marks the spot among fellow grads for Nick Culbertson, of Dunellen, New Jersey, at the Quincy House ceremony during Harvard University Commencement on May 26, 2011, in Cambridge, Massachusetts, USA. Nick Culbertson (right), of Dunellen, New Jersey, and his grandmother Lillian Culbertson walk to the Quincy House ceremony during Harvard University Commencement on May 26, 2011, in Cambridge, Massachusetts, USA. 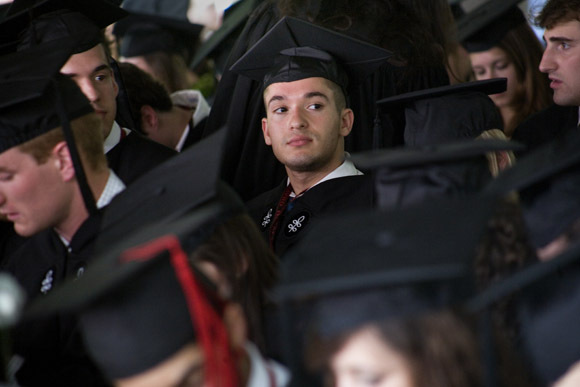 Nick Culbertson, of Dunellen, New Jersey, waits to receive his diploma at the Quincy House ceremony during Harvard University Commencement on May 26, 2011, in Cambridge, Massachusetts, USA. Nick Culbertson (center), of Dunellen, New Jersey, wipes a tear while posing for pictures with Dr. David Myers (left center) after Culbertson received his diploma at the Quincy House ceremony during Harvard University Commencement on May 26, 2011, in Cambridge, Massachusetts, USA. Myers provided financial support to Culbertson throughout his schooling. 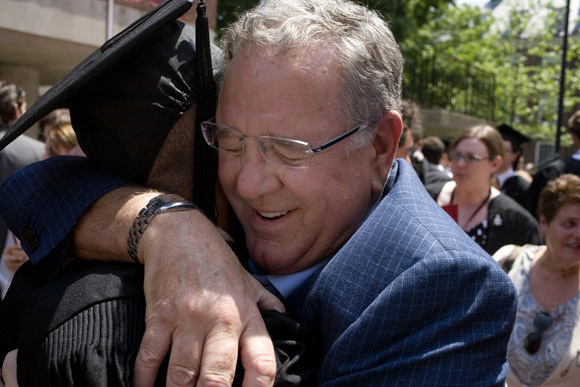 Nick Culbertson, of Dunellen, New Jersey, hugs Dr. David Myers (right) after Culbertson received his diploma at the Quincy House ceremony during Harvard University Commencement on May 26, 2011, in Cambridge, Massachusetts, USA. Myers provided financial support to Culbertson as he attended high school and college. 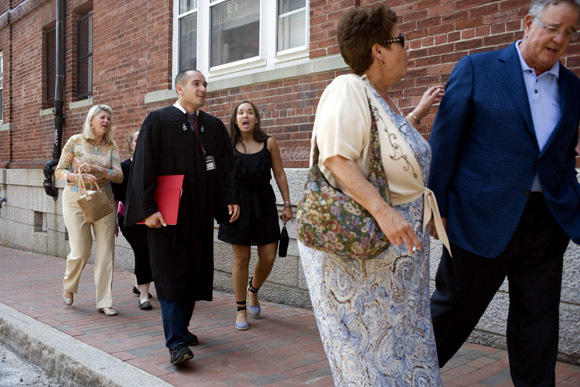 Dr. David Myers (from right), Lillian Culbertson (grandmother), Ashley Lyles (sister), Nick Culbertson, Leticia Culbertson (obscured, mother), and Sue Myers, walk to the subway after attending the graduation of Nick Culbertson, of Dunellen, New Jersey, at the Quincy House ceremony during Harvard University Commencement on May 26, 2011, in Cambridge, Massachusetts, USA. Nick Culbertson (center), sister Ashley Lyles (left center)and mother Leticia Culbertson (right center) ride a subway to lunch after attending the graduation of Nick Culbertson, of Dunellen, New Jersey, at the Quincy House ceremony during Harvard University Commencement on May 26, 2011, in Cambridge, Massachusetts, USA. 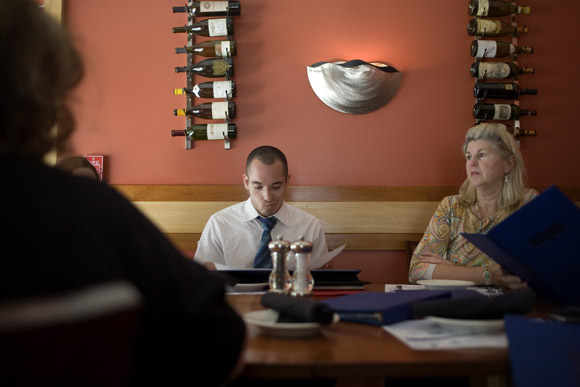 Nick Culbertson (center), of Dunellen, New Jersey, celebrates with family at lunch at Legal Seafoods in Boston, Massachusetts, after his graduation from Harvard University on May 26, 2011. Also pictured, at right, is Sue Myers. Myers, along with her husband Dr. David Myers, provided financial support to Culbertson during his schooling. One of my favorite parts of photojournalism is getting a glimpse into people’s lives at their most exciting moments. This assignment was no exception. Shooting for the New Jersey Star-Ledger, I spent the day with Nick Culbertson and his family as he graduated from Harvard, the culmination of a long-road started when the paper wrote a story about two children and their grandmother living in a motel in Dunellen, New Jersey. The community came to the family’s aid and through the dedication of Nick, his sister, his grandmother, and a handful of people, both children graduated from college. You can read the story here: On graduation day, grandmother’s toil pays off. And here you can see how the story appeared in print.